Aluminum is the third most abundant element in earth’s crust, but its chemical properties have prevented its presence in the biological cycle of living organisms. Nevertheless, the acidification of the environment due mainly to human intervention has facilitated its solubilitation, thus increasing its bioavailability. Toxic effects of aluminum in the human body have been reported, and this element has been related with neurodegerentative diseases such as Alzheimer Disease. Aluminum has also been claimed to exert an important pro-oxidant activity. How aluminum can access the human organism is of primary importance. This implies knowledge about the kinetics, solubility and mobility of this element. In this sense, the speciation of aluminum has attracted the attention of many research groups. Aluminum is able to form a variety of hydrolysis products depending on the pH conditions, but Al(III) can also complexate with a variety of organic, inorganic or phosphate ligands. 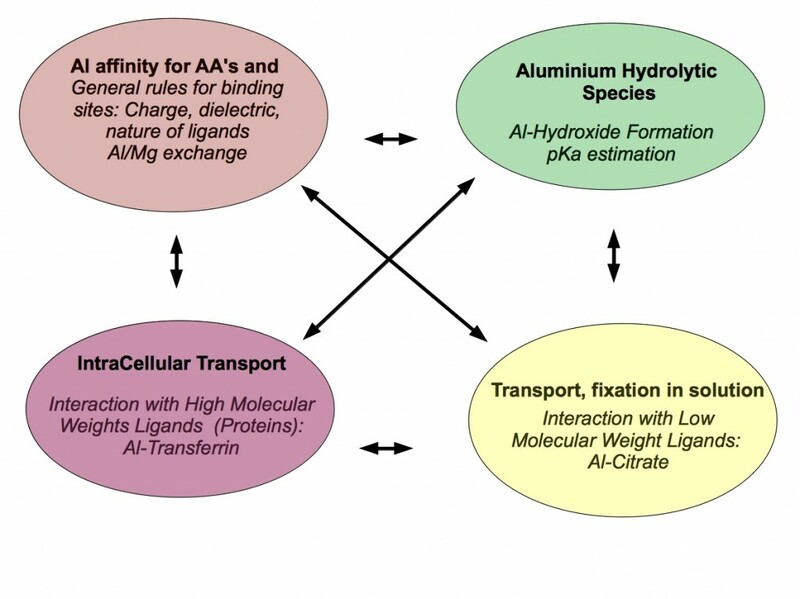 Of particular importance is the speciacion of aluminum in serum, where Al(III) interacts with high molecular mass (HMM) and low molecular mass (LMM) species. Among the HMM species the most important one is serum-Transferrin, and citrate and phoshates are among the main LMM chelators. In fact, it has been assumed, not without controversy, that aluminum can follow the iron pathway to enter the cell by receptor mediated endocytosis. Nevertheless, the interaction between Al(III) load transferrin and the receptor is questionable. Alternatively, it has been proposed that aluminum can get the brain not by Tf-TFR pathway, but rather complexated to citrate. Whatever is the pathway used by Al(III) to enter in the cell, it is well know that its presence can alter the cell biochemistry in different ways. On one hand, it can disrupt metalloproteins that contain metal ions of similar size, such as Mg(II). Mg(II)/Al(III) substitution can thus alter the electronic and structural characteristics of the near-by residues, affecting the overall protein structure. On the other hand, Aluminun has demonstrated a significant pro-oxidant activity, which is still far from being understood at the molecular level. 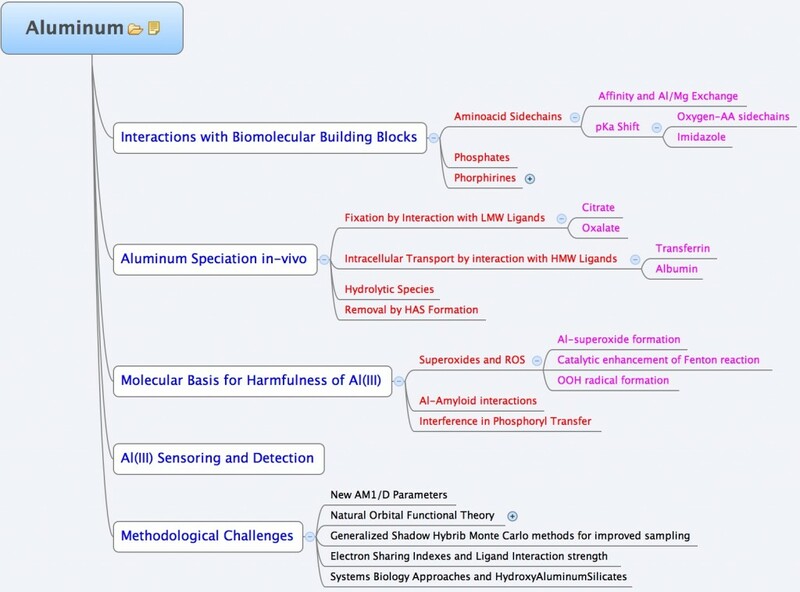 In the group, we use a variety of theoretical tools ranging from highly-accurate quantum chemical methods, to Force-Field Molecular dynamic simulations to unveil some of the aspects of the Aluminum interaction with biological systems. The following chart summarizes the different interests of the group in this area. E. Formoso, J. I. Mujika, S. J. Grabowski, X. Lopez, “Aluminum and its effect in the equilibrium between folded/unfolded conformation of NADH“, J. Inorg. Biochem., vol. 152, pp. 139-146 (2015). DOI: 10.1016/j.jinorgbio.2015.08.017. N. B. Luque, J. I. Mujika, E. Formoso, X. Lopez, “Aluminum interaction with 2,3-diphosphoglyceric acid. A computational study“, RSC Adv. vol. 5, pp. 63874 (2015). DOI: 10.1039/c5ra06796k.